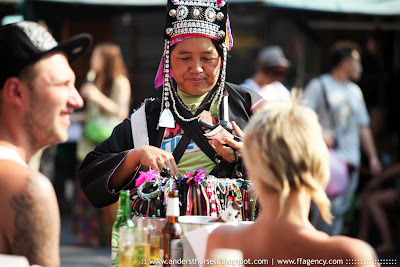 The Akha woman is selling souvenirs to beer drinking Brits @ Khao San Road, Bangkok, Thailand. Date: February 2, 2011. The Akha are a hill tribe of subsistence farmers known for their artistry. The ethnic group may have originated in Mongolia around 1500 years ago. Most of the remaining Akha people are now distributed in small villages among the mountains of China (where they are considered part of the Hani by the government, though this is a subject of some dispute among the Akha themselves), Laos (where they are considered Lao Sung), Myanmar (Burma), and northern Thailand, where they are one of the six main hill tribes.